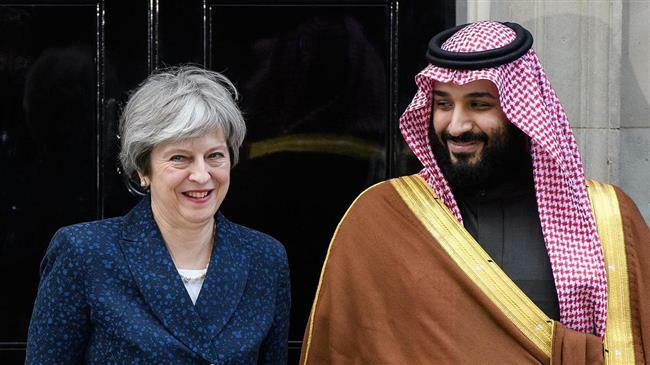 London(ANN)-Saudi Crown Prince Mohammed bin Salman and British Prime Minister Theresa May have discussed possible ways of confronting Iran and its growing role in the Middle East. May’s office said Sunday that the two leaders agreed over the phone on the need to tackle what they call “Iranian destabilizing activity” in the region. “As part of this the Prime Minister noted the importance of cooperation between their two countries to protect Saudi Arabia from ballistic missile attacks,” the statement added. More than three years after waging a deadly war against the people of its impoverished southern neighbor Yemen, the Riyadh regime has been unable to stop a barrage of ballistic missile attacks by Yemeni army and popular forces that have successfully hit targets deep in their territories. Outraged by their defeat against Yemen’s domestically developed missiles, Saudi rulers and their Western allies have repeatedly accused Iran of providing missile technology to the Houthi Ansarullah Movement, a militia group that took over from Yemen’s former corrupt government in 2015. This is while Yemen’s main marital and aerial gateways have been under a tight blockade by Saudi Arabia and its allies over the course of the war. May and Bin Salman also discussed the 2015 nuclear deal between Iran and world powers, which has been recently undermined by US President Donald Trump’s pullout. Saudi Arabia and Israel have been two of the main critics of the deal, known as the Joint Comprehensive Plan of Action (JCPOA). The UK, France, China, Russia and Germany are the other signatories who have expressed firm support for the JCPOA despite the US pullout. During her conversation with the Saudi prince, May once again voiced her country’s commitment to saving the deal. May and Bin Salman also exchanged views on the global oil market amid speculation that Saudi Arabia, as the world’s top oil exporter, and top producer Russia are likely to boost output. This has put downward pressures on oil prices.